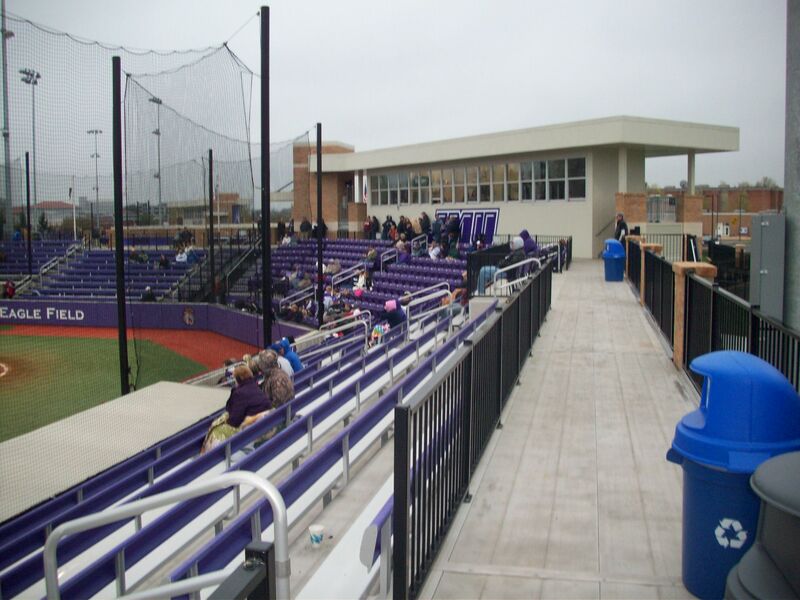 Ballpark Basics: a newly constructed complex that houses two baseball teams, and a softball team. Ballpark Breakdown: They have played baseball at this site since the 1940’s when the Harrisonburg Turks from the Virginia League played here at what was nothing more than a crude cement grandstand with bleacher seats. 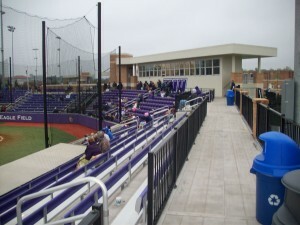 (You can see what the park used to look like at ballparkreviews.com) In 2008 James Madison University purchased the land that Veterans Memorial Stadium was on and in September of 2008 they began to demolish the old grandstand. The park went under a $9 million renovation that was finished in 2010. Veteran’s Memorial Park was dedicated in 1948 to the 139 area veterans that were killed in World War II. A plaque with these names was displayed at the old stadium and has now been moved to the entrance of the new stadium, which has multiple fields for softball, baseball, and also houses indoor and outdoor training fields, weight rooms, locker and trainer facilities, offices and the like for both sports. 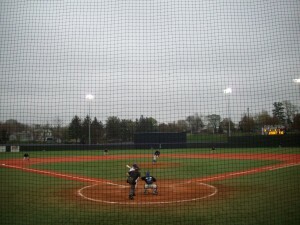 The field specific to baseball is named Eagle Field after the former mayor and donor Rodney and his wife, Sylvia Eagle; and is actually home to two Harrisonburg baseball teams, the Harrisonburg Turks and James Madison University’s Dukes. 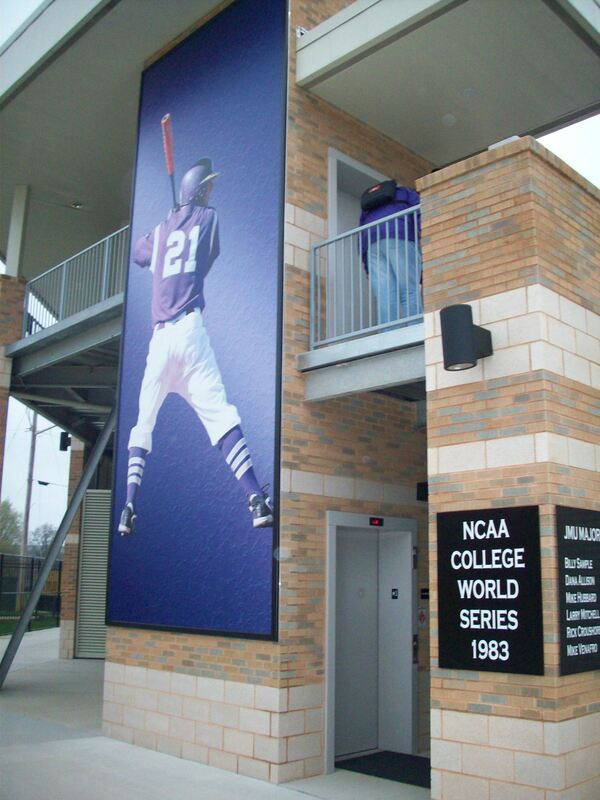 JMU has placed its stamp on the complex with plaques commemorating their accomplishments including their trip to the College World Series in 1983 and multiple NCAA and CAA post season appearances. A building that houses the concession stand and swag shop sits between the two fields. Vetrans Memorial Park is constructed above ground level, so you have to walk up a set of stairs to get up to the main concourse. It is a fairly traditional stadium with purple seats behind home plate and purple bleachers down each of the baselines. They have a large net that surrounds the entire seating are so no matter where you sit you have to watch the game through the netting and at some points that large poles that hold up the nets. A lot of time has obviously been spent on landscaping the area, and they included nod to the region in the architecture by constructing the entire complex out of bluestone, a local stone that was also used to construct much of JMU itself. We showed up on a dreary cold day when the game was scheduled to start at 6 pm. However, due to a rainout the night before and the threat of rain again this night, they moved the games up and played a double-header. Unfortunately there was no news of this on the website so we showed up at the bottom of the 7th…of the second game. Given how cold it was and that they weren’t playing another local foe we were surprised at the number of people in the stands. In fact the final attendance was announced at 684, which isn’t close to their highest attendance ever, (1,815 recorded on March 17, 2010 against The University of Virginia) but still, not bad. Baseball Nerd Fact #8: The Turks got their name because Rockingham County is the poultry capital of the world so they just shortened Turkeys to “Turks”. The Turks have had a lot of success getting people to the majors, including the White Sox Juan Pierre, and David Eckstien who played for 5 different major league teams including the Angels, Cardinals and Padres. Brew Basics: A favorite spot where locals and college students come together over good beer. Cally’s is located right on the main square in the center of Harrisonburg, this is obviously a favorite spot for locals and students from the local university, James Madison. We found a lot to like about this place. The beer was good, the prices were fair, and best of all the staff was personable, and knew their stuff. They didn’t make you feel like you were wasting their time with questions, and they’d been well trained and all had an immediate answer when asked which was their favorite beer, and why. Another plus were the daily specials, different drink specials every day of the week and half off apps between 4:30 and 6:30, including the huge plate of nachos we shared for an early dinner. The main drawbacks we noticed were the plain chain like décor (clean but with generic chairs, basic lighting and plain white walls in a spot with a lot of potential), and the number of beers on tap(4). You enter the building Cally’s is housed in through a hallway, and proceed into the restaurant. 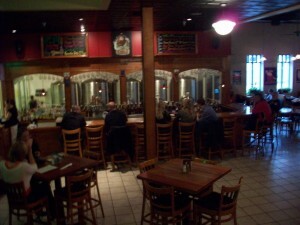 It opens into a large host stand, where you can turn left to the bar and brewing section or right to the dining area. There were a few large TV’s within view of both sections. The entry also includes a swag area with the requisite t-shirts and pint glasses – and they do have a large number of fairly cool ones to choose from; we came home with a pint glass whose image is the historical marker on the main road into town, which explains the establishment of the city itself. 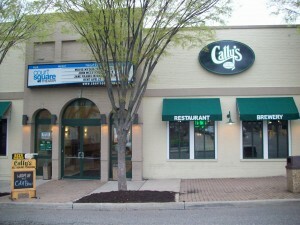 Cally’s also has an upstairs which contains a second bar, a large open room for their club/dancing part of the evening (it is a college town!) that can also be rented for parties, and best of all, a large, newly refinished rooftop deck, which is open for drinks and dining. We were told that they usually had at least five beers on tap, but were out of their signature “Smokin’ Scottish” and worse, we had visited on a day that they were between seasonals; the Imperial Bourbon Barrel Stout was long gone, and they had yet to roll out the new Nut Brown. Basically all the favorite beers in our wheel house: not available. Fortunately we are intrepid beer drinkers and did not let this derail our tasting mission. Happily, we really did enjoy each beer we tasted and found each to have solid, well rounded and distinct flavor, we just wished there were more to try! Cally’s Kolsch- (4.7 ABV/ 18 IBU) This one was actually placed second on the flight, but we recommend trying this one first. It was a very light yellow, with only a hint of an aroma. A clean, sparkling beer that’s an easy drinker; but it’s the lightest (by far) of all the ones they have on tap, and the flavors tend to be drowned out when you’ve tried other brews beforehand. Try this one first, and enjoy it in its own right. Single Hop Switzer Pale Ale – (6.0 ABV/44 IBU) Gillian’s favorite of the four they had on hand. This beer has a moderately high carbonation, thick copper cider color and long lasting ivory lace. The aroma is definitely citrus, but with floral notes, and once tasted, the hops are consistent and noticeable without overpowering the rest of the flavors which are a bit spicy with a slight bite. Hefe Weizen – (5.5 ABV/12 IBU) For having such a plain name, this concoction was anything but. Of course it was unfiltered, but it seemed less so than most, basically more clear, less floaters. At first sniff we were surprised by the complex aroma and strong spices (cloves and nutmeg perhaps?) but this hefe also has banana in it (another banana beer!? A new fad to note perhaps?). This makes what would probably be a light coppery colored beer more of a dirty peach, and adds just enough fruit to make it a true hefeweizen while being a lot different than most versions of this style that you might have had.